NFL Cabernet 8-piece wine accessories set in gift box with team logo. Includes a lever-style cork-pull, two bottle stoppers, a drip ring, foil cutter, pourer/stopper, wine thermometer and an extra cork-pull worm. High quality wine accessories perfect for any bar. Wine tools nest inside handsome box with hinged lid and pull out drawer. 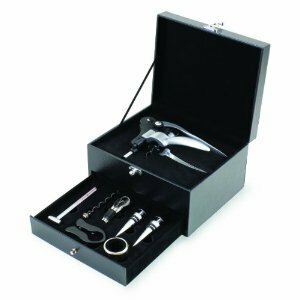 This NFL Cabernet 8-piece wine accessories set features attractive and functional wine tools in a handsome gift box with an engraved team logo. Included in this set: A lever-style cork-pull, two bottle stoppers, a drip ring, foil cutter, pourer/stopper, wine thermometer and an extra cork-pull worm. All of the tools nest into a handsome presentation box with a lid and pull-out drawer that is made of black premium leatherette with white accent stitching. The Caberent makes an amazing gift for your wine-loving friends.